It's very still out there in the garden. The mystery pianist a few doors down is playing 'Waltz of the Flowers,' and I went outside to have a better listen. 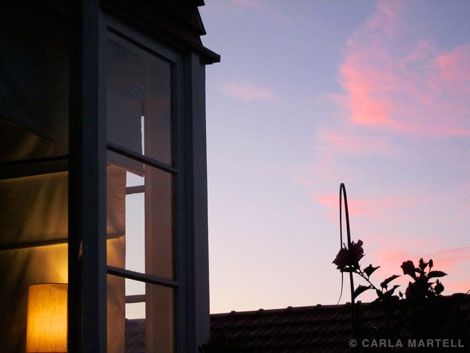 There's a very small breeze, and both the sky and the camellias glow a soft blushing pink. Tropical cyclone Wilma is due to whip into the country tomorrow, but you'd never guess. All the weather is so upside down at the moment, you never quite know what to expect, but it sounds like we could be in for another blasting.